1. What is the best way to extend and maintain the life of my regenerative blower(s)? A. 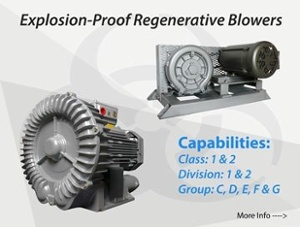 If you take the time to replace and maintain our regenerative blowers, you can avoid large replacement or repair costs. 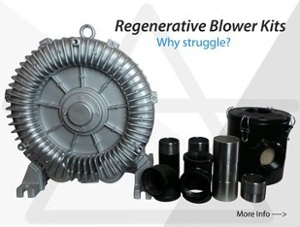 Our maintenance kits are the best way to maintain and even EXTEND the life of your Atlantic Blowers regenerative blower. 2. Why is my blower so hot? 3. Why is a relief valve important? A. A relief valve relieves unwanted pressure build up, known as backpressure. Excess backpressure WILL burn out a blower’s motor or bearings. A relief valve can save you the cost of a replacement blower. 4. My blower will not turn on, why? A. Call customer support immediately, the motor may be burned out. We will give you a few options of what to do next and get you back up and running – (214)233-0280. 5. What maintenance does my blower require? A. Virtually none, there is no need to grease/oil the bearings as they are sealed and already lubricated when you receive your new blower. Our bearings are designed to last at a minimum, 20,000 hours. 6. Can I mount my blower vertically? A. The blower can be mounted vertically, but only with the inlet/outlet facing up. The blower cannot be mounted with the Inlet/Outlet facing down. See page 11 of your Owner’s Manual for additional information. 7. Can I exchange my blower for a different sized blower? A. Yes, Atlantic Blowers’ exchange program states the following; if your blower is in “like new” condition it can be exchanged within 30 days at the cost of shipping. You may then be credited, or pay the difference in cost of the blowers. 8. My product was damaged during shipping, what should I do? A. Take photos of the damage and packaging immediately. For further instruction call (214)-233-0280. 9. How do I adjust my relief valve? A. You will need an allen wrench (Hex key) and a socket wrench. Insert the hex key into the slot on the vacuum side. Use the socket wrench to adjust the nut on the pressure side of the relief valve. 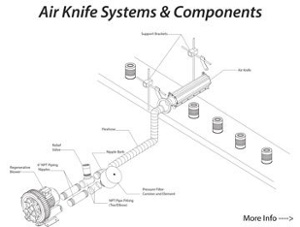 Test your application to ensure your system is working properly. Check your blower’s temperature regularly when adjusting your relief valve; if your blower is too hot then your blower is building up back pressure. Adjust the relief valve accordingly and continue checking the temperature of your blower and functionality of your application. Call (214)-233-0280 for assistance when adjusting your relief valve. 10. My relief valve is not functioning properly, why? A. Is your application pressure or vacuum? Relief valves are reversible; allowing them to be utilized for pressure and vacuum, your relief valve may be installed upside down. If your relief valve is installed correctly, try adjusting your relief valve to open at a lower pressure, it may be adjusted too tight. 11. How do I know what a normal running temperature is for my blower motor? A. All of our motors are tested to 285F and should NEVER exceed 300F. Bigger blowers will have a higher running temperature due to the higher pressure and stress on the motor. But the same rules still apply, NEVER exceed 300F. 12. Why does my blower keep tripping the breaker? A. On startup, the blower can spike as much as 5x the running amps of the blower, make sure this is taken in to consideration; running amps are displayed on your motor tag. Setups vary widely between customers, so if you’re still having issues please contact customer support – (214)233-0280. 13. Is my blower making a humming/whining noise? A. This is the first indication that your bearings are at the end of their life, shut the blower off IMMEDIATELY and do not run until the bearings have been replaced. Call (214) 233-0280 to order replacement bearings. 14. How do I know when to replace the bearings? A. If there is no abnormal noise (mentioned above) we recommend that the bearings are replaced after 2 years of continuous use. If the aforementioned happens before the 2 year service mark, follow the answer to question number 7. 15. I do not see my question on the FAQ, what do I do? A. Give us a call (214)-233-0280. At Atlantic Blowers we are always happy to answer any questions you may have.